OSF Preprints allows for search of content hosted on the OSF and across several other preprint servers to make discovering preprints easy. 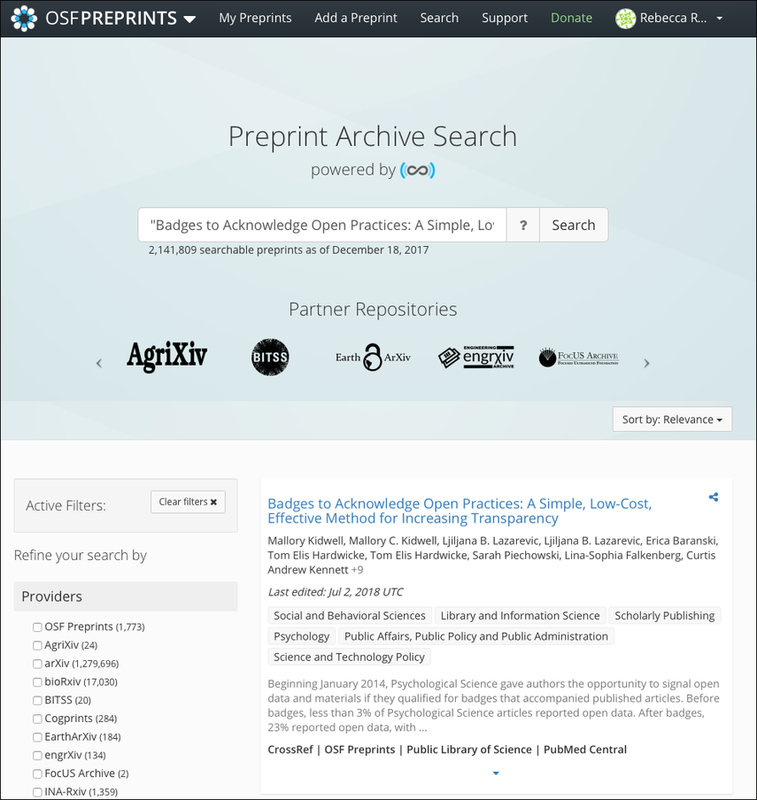 This article shows the ways you can search and browse preprints. Preprints search is powered by SHARE. Outside of searching on the preprint servers, preprints are also indexed in Google Scholar and SHARE. First, go to either the OSF Preprints or a community preprint server's homepage. Type your search query into the search box and then click Search. The search results will appear on the "Preprint Archive Search" page. Results will show the title of the work, author(s), date and time when the preprint was added, discipline(s), abstract, and the preprint provider. Click the drop-down arrow at the bottom of a search result to access more metadata. Click on a preprint title to open and read the preprint. 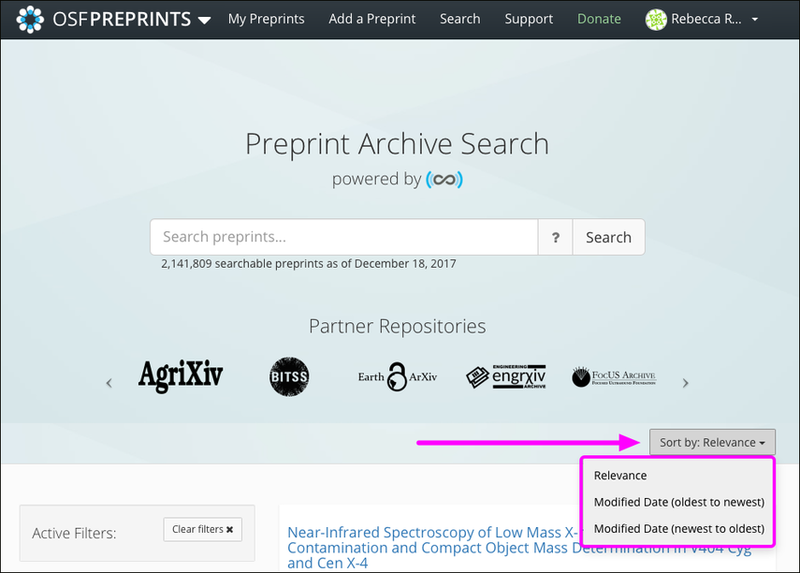 If the preprint is not hosted on OSF Preprints or a community preprint server, clicking on its title will take you to the original source (e.g., arXiv.org). 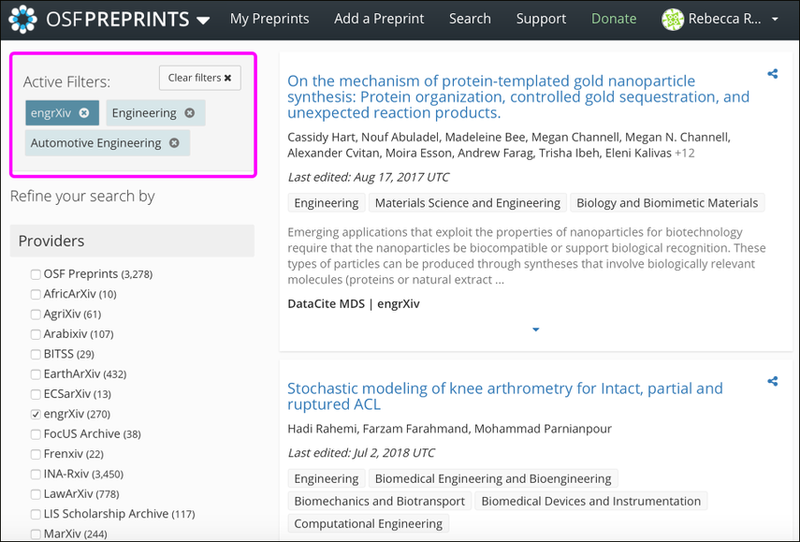 You can browse preprints by subject area without entering a search query. Go to the OSF Preprints or community preprint server's homepage. Scroll down until the "Browse by subject" section appears. Click a subject name from the list. Preprints within that subject area will appear. The subjects that are custom to a preprint server will not be listed as subject filters on the OSF Preprints "Discover" page. 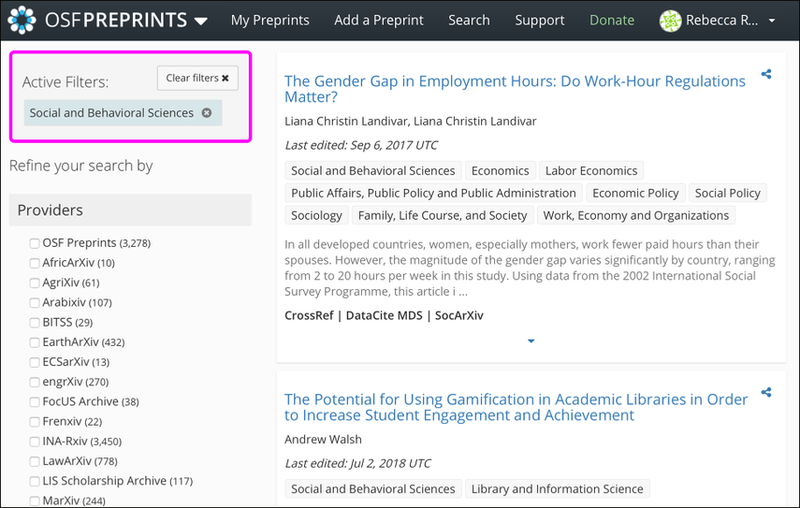 Those preprints that are tagged with the custom subjects will be aggregated in OSF Preprints, but the custom subjects themselves will only be searchable via the respective preprint server. Add filters from the left sidebar menus to refine your search. You can search by preprint provider and/or by subject. Check the box next to a provider or subject name. You can click the > symbol to expand subject hierarchies. Search results will appear automatically. You can click the Sort by menu in the top right of the page to sort results by relevance or date. Search results will be sorted accordingly.